IBM is conducting an Off Campus drive to hire Freshers from batches 2016, 2017 and 2018. You fill find everything that you need to know about IBM Off Campus Off Campus drive 2018. We have noticed one interesting fact for IBM off Campus Drive for 2018 Batch Freshers that, they are recruiting for all the processes IBM IRL, ISL, GBS, GTS. 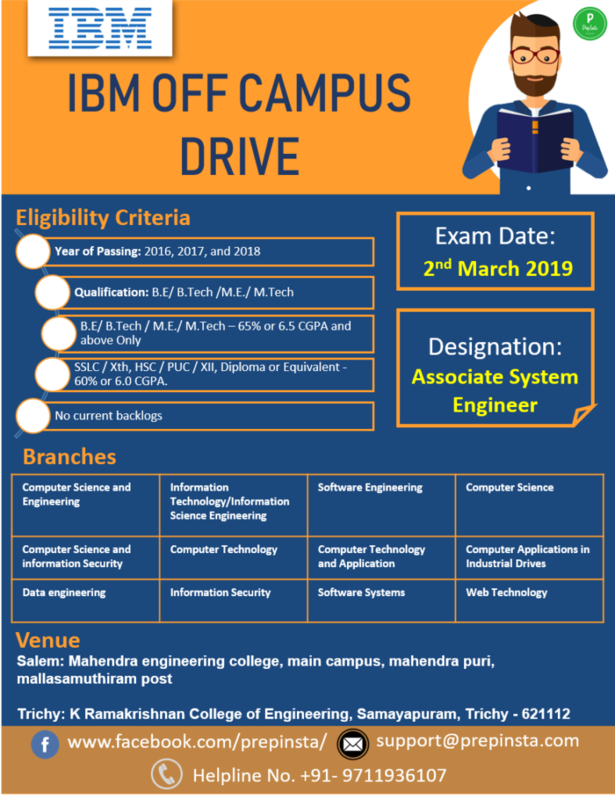 You can find information on how to apply for the IBM Off Campus Recruitment drive, Eligibility Criteria, and how to prepare on this page. other local colleges – 3.25 LPA. It depends on which department of IBM they are visiting your campus too, if they are visiting for IRL i.e. IBM Research Facility then the package will be higher upto 12 Lakhs. For GTS and GBS package are generally lower. IBM has introduced IBM referral drive for 2016 and 2017 graduates, the company has asked employees to refer Freshers and Experienced both. He will refer you and you will get email from IBM regarding the procedure. If you dont have any relative, friend or family working there then contact your placement cell of college they will help. Your friends at IBM can refer you before deadline ends(Check Deadline date with IBM Employees for the IBM off-campus referral drive 2018. Generally we have seen that HR’s prefer to select candidates who have applied through referral. But, you can also apply directly, though there will be less chances than referral application to get selected. 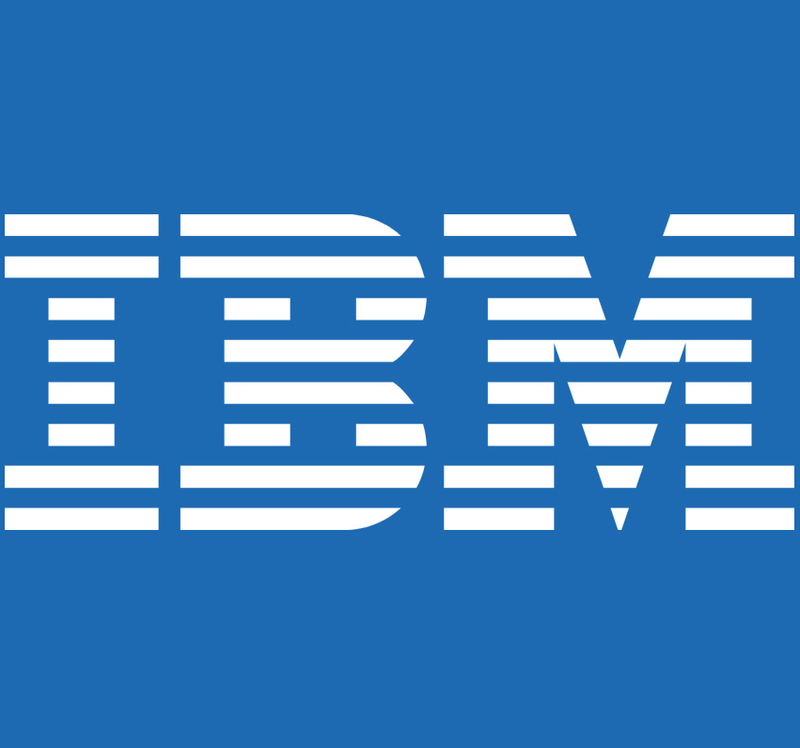 You can visit the following link to apply directly for IBM Freshers, also visit the following link to apply for IBM. I applied for the IBM off campus drive with a referral code. One of my relatives is placed in IBM Kolkata as the Software Engineer. I sent him my details and documents, and he provided me the IBM referral code through which I applied for the interview. I opted for the post of System Engineer at Global Business Services (GBS). 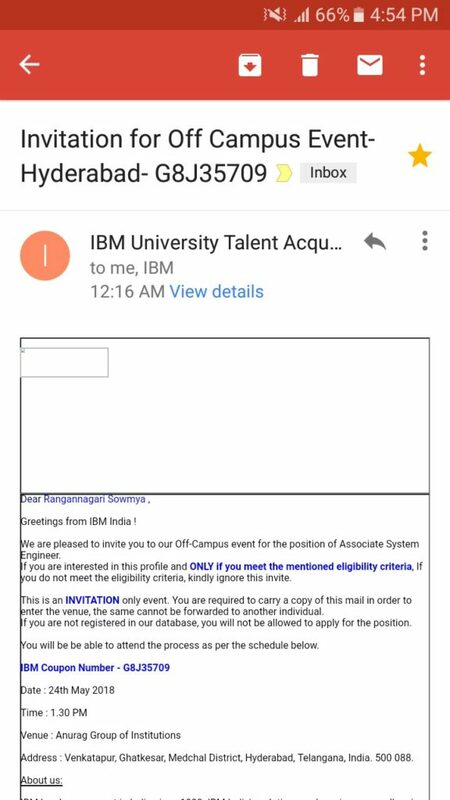 I received an invitation email from IBM to attend the placement drive. There were 18 questions on the Quantitative Ability and 18 questions on the Number series. There was a time limit of 2 min 15 seconds for every question and if the time limit exceeds the question will be auto-submitted. The difficulty level of the questions was moderate to high. 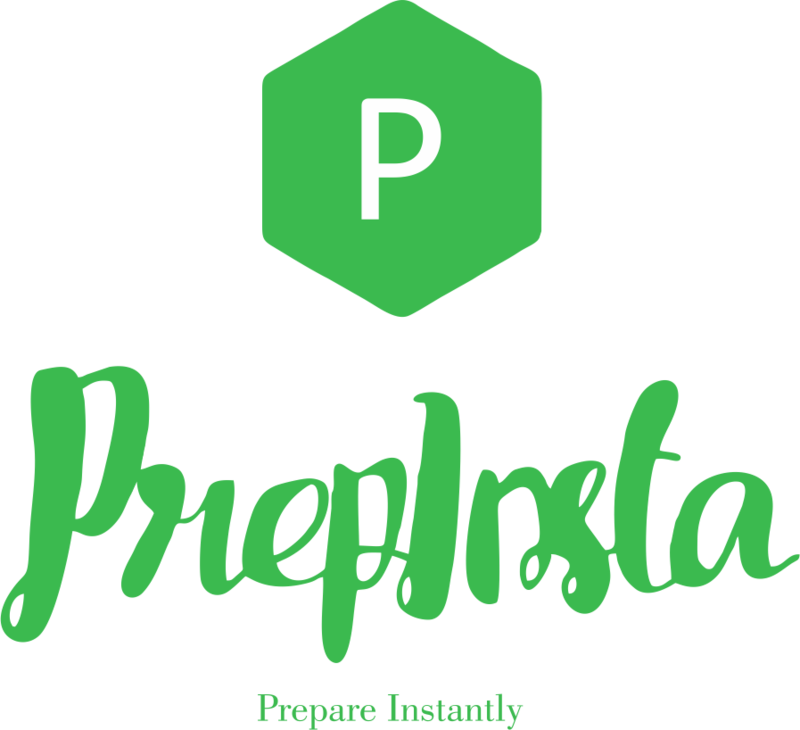 The PrepInsta practice papers were a great help while preparing for these sections. In the Business Communication Test, there were 22 MCQ questions and the total time limit was 20 minutes. The difficulty level of all the questions was moderate. There were no reading comprehension passages. Instead, there were questions related to active /passive voice, synonyms, antonyms, and fill in the blanks. There were some questions related to effective email writing. After clearing the Written Round, I was selected for the face to face interview. I was very nervous before the interview, as only the candidates who cleared this round would be shortlisted for the HR round. My cousin told me to prepare well for this round and be thorough with the resume. As I entered the cabin, the interviewer was seated there. He asked me for my resume. I handed over my resume to him, and he started asking questions related to C, C++, and database. What are linear and non-linear data structures? What is an inner join and an outer join? Write the logic of merge sort. What is an LRU cache? Is this tree BST or not? Can you draw an ER diagram of the project? Is there any difference between having and where clause? Write the query to print duplicate rows in a table. The interview continued for an hour. I was hoping for a positive result. The results for the Technical round were declared, and I cleared this round and moved further for the final round. After the technical round, I was quite confident for this round. I entered the cabin and greeted the HR. He asked me general questions related to my interests, career plans, etc. You had a gap of eight months after your graduation, what were you doing? Why do you want to join IBM? Any plans of doing M.B.A. or Mtech? Rate yourself on a scale of 1 – 10 in teamwork. Where do you see yourself in next two years? The interview continued for 15 minutes. I was asked to submit the Xerox copies of my documents for further verifications. After a week I received an email from IBM that I have been selected for the profile of System Engineer. That was the happiest day of my life. 1. Plan your travel keeping in mind the time and duration of the event. The overall event is planned over a span of two/three days, hence make your own arrangements accordingly. Please note that IBM will not be responsible for any travel and accommodation. 2. Kindly read the eligibility criteria thoroughly. 2. B.E/ B. Tech/M.E./ M.Tech – 65% or 6.5 CGPA and above Only. 3. SSLC / Xth, HSC / PUC / XII, Diploma or Equivalent – 60% or ​6.0 CGPA. (Calculation of qualifying marks = Sum total of marks obtained divided by Sum total of maximum marks obtainable. Computer Applications in Industrial Drives, Data engineering, Information Security, Software Systems, Web Technology.